These cubes are a fun variation of a familiar form that are similar to other stacking blocks but have more graphics and characters. These blocks are very colorful. There is one animal for each box so it can be used for matching. The boxes nest for easy storage. The coated heavy cardboard is very durable and very brightly printed. 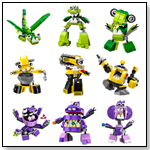 The adorable animals and characters are made of soft PVC and are washable. In addition, each piece uses all sides for different motifs, so the sets are open-ended. For 18 months and up. — In a February 2012 survey about bestselling wooden toys, Barbara Fineblum, owner of Barston's Child's Play in Baltimore, Md., told TDmonthly they sell 12 units of this item each month. This set includes 41 magnetic geometric shapes that can be creatively combined to animal shapes, people, patterns, and more. The set includes 24 design suggestions cards to get the creative juices flowing. 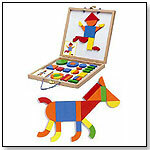 Kids can create shapes, animals, and people with the 42 geometric shapes included in this set. The set includes 24 idea cards. The wooden storage case with metal closure doubles as a playing surface for the pieces. White two story house with red roof. Fully painted and decorated with strawberry motif. Side opens up for easy access. Doors, windows and shutters open and close. Includes deluxe starter furniture set. Furniture includes sofa, coffee table, lamp, dining table with chairs, oven/stove, buffet, bunkbeds, end table with lamp, toilet, toys and more. People are not included. 13 ¾ x 24 ¾ x 17 ¼. — Joe Berardoni, owner of Pun's Toys in Bryn Mawr, Pa., told TDmonthly in a Summer 2011 survey that he sells one of these high-ticket items each month. The Malta Knight figuring from Papo is detailed play figure ready for action. With his sword raised and helmet turned to face his assailant, he can stand alone or ride one of the man armored horses available in the line. The Malta Knight wears chain mail and a bright red tabard emblazoned with a white cross, finished with period inspired details like his shoes, helmet, and scabbard. 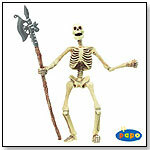 —“[Our best seller is] Papo action figures by Hotaling Imports. We can't keep them on the shelves,” said Kathy Burns, manager of My Favorite Toy Store in Downer's Grove, Ill., during a July 2010 survey of top-selling action figures. — Nine out of 38 retailers said Papo is a best-selling item in their stores. — Linda Laramy, owner of Crackerjacks Toys and Childrens Books in Easton, Md., told TDmonthly in a Summer 2011 survey that she sells "a couple dozen" Papo knights each month, making them her best-selling action figure. This knight action figure wears a suit of silver armor decorated with a unicorn emblem. The set includes a horse figure with matching armor. — Eight percent of 38 retailers told TDmonthly in July 2010 that Papo figures are a top-selling collectible. The Papo toy line features well-crafted figurines and animals. 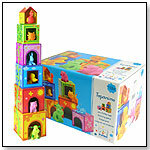 Papo toys come in a wide variety of colors, all hand-painted and modeled on a 1:20 scale. 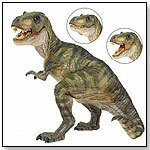 The T-Rex is part of their Dinosaur/Prehistoric line. Launch date: 2010. This hand-painted Black Bear by Papo is a high-quality animal figure. Operations Manager of Hotaling Imports Brian Shackelton told TDmonthly, "The design of all Papo products is realistic and natural, which enables you to experience the large variety of nature — from domestic animals on a farm to wild animals in the jungle." Launch date: March 2010. — Papo Figures were best sellers at Figpickels Toy Emporium in Coeur d’Alene, Idaho, in late summer 2010, according to owner Brett Sommer. “Customers love the quality and selection,” he noted. — In a Summer 2011 survey, four out of 14 retailers told TDmonthly that Papo was their best-selling brand of action figure. Part of the Wild Animal Series by Papo, this hand-painted figure is very detailed and shows an authentic representation of how tigresses carry around their little bundles. It is approximately 1:20 scale. 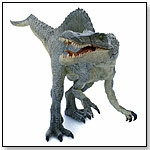 "Papo wildlife series is easily the best quality figure for the price. The proportion and stance are exact as well as the coloration," Brian Shackelton, Operation Manager, Hotaling Imports Inc., told TDmonthly. Launch date: March 15, 2010. Knight Pegasus is adorned in armor, with a black and red cape, a red shield bearing a pegasus emblem, and plate helm with the bust of pegasus on top of the helm. King Richard is dressed in black and gold colors, holding a jousting lance and a shield featuring lions on it. From the Tales & Legends line, this princess is wearing a rose red dress with black trim, with a flower adornment on the head, and a paper fan in her hand. This firefighter is suited up in his flame retardant gear and air tank. In his hands is a hose ready to extinguish fire. This asian dragon features tan brown scales with red flames. This mutant shark pirate is a dual-wielding, half man, half shark buccaneer. Brandishing multiple weapons, this humanoid ram is ready for battle. Riding on his armored war griffin, this bird man soars into battle. The Texan Bull is part of the Farm Life Series by Papo, featuring detailed artwork on hand-painted figurines. Launch date: April 2009. This hand-painted Turtle Caouanne is a 2009 addition to the Papo Sea Animals Collection. "The realism, poses, movement, detail and quality that Papo offers," set these figurines apart, Brian Shackelton, operations manager for Hotaling Imports, told TDmonthly. Launch date: April 2009. The Papo Lioness with cub is created with detail and designed to authentically display how lionesses really carry around their cubs. "[The] Papo wildlife series is easily the best-quality figure for the price," Brian Shackelton, operations manager for Hotaling Imports, told TDmonthly. Launch date: September 15, 2006. With pole-ax brandished, this creepy skeleton is not only hand painted in detail but also glows in the dark for a little extra ghoulish fun once the light goes down. The skeleton stands on his own, ready to take on whatever role is required in a child's story telling. ― “Papo is our better seller for that,” replied Michelle Smith, owner of Piccolo Mondo Toys in Portland, Ore., when asked about her best-selling action figures in July 2009. ― “Papo is a real constant seller and it remains steady all through the year,” said Michelle Sahr, owner of My Little Red Wagon in Stow, Ohio. ― Nine of 49 retailers said in summer 2009 that Papo is their top-selling brand of action figures. This dinosaur is almost a foot long, 6" tall, and designed to be in a realistic, frightening pose. Like other Papo dinosaur figures, the Spinosaurus's mouth opens and closes. Launch date: June 2007. The articulated jaw of this Allosaurus really opens and closes. The hand-painted dinosaur is approximately 1:20 scale and measures about 10.5". It is made of durable synthetic material. Launch date: July 2008. This hand-painted figure has an intricate suit of armor and wields a broad sword and battle ax. Launch date: April 2009. This hand-painted dragon is wearing armor and has fire coming out of its mouth. "Hotaling Inc. believes that in a world full of too many passive play options, children should be encouraged to engage in self-driven play. That's why they distribute simple and attractive toys with child friendly designs that encourage them to actively use their imagination and develop through active play, stimulation and, above all, fun," Brian Shackelton, operations manager for Hotaling Imports Inc., told TDmonthly. Launch date: April 2009. · Will American Kids Want Some Tsum-Tsum?